Home / Lefse / 7 Up Lefse!?!?! Lefse daredevil Kyle Bouck prepares himself for making 7 Up lefse. Brave man! As a child, I visited Grandma Liz in Valley City, North Dakota, and then later at a hobby farm in Michigan, North Dakota. There was always lefse and kumps, also known as klub or potet klub. I moved out East for a government job, and I missed the joyous events and the sad ones, especially when Dad passed in 1995 and then Grandma Liz a few years later. At the time, I realized how much I missed visiting her with my Dad on the farm. As time went on, to help remember those visits and to pay tribute to her, I set out to learn to make lefse and kumps. When researching lefse making, I came across a recipe for 7 Up lefse. I thought, “No way! That’s not how Grandma used to make it.” So I filed away the recipe and learned to make lefse the way Grandma made it. 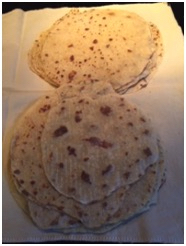 I’ve since made traditional lefse, but I’ve also made 7 Up lefse a couple of times. I must say, it‘s not bad at all! The last time I made 7 Up lefse, it was after returning from the 2018 Norsk Hostfest in Minot, North Dakota. 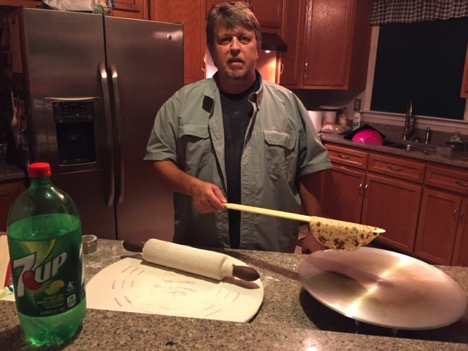 I wanted to try the 7 Up lefse recipe again and try it out using my new heirloom lefse rolling pin (pictured below) I purchased from Gary Legwold in the Author’s Corner of Helsinki Hall. 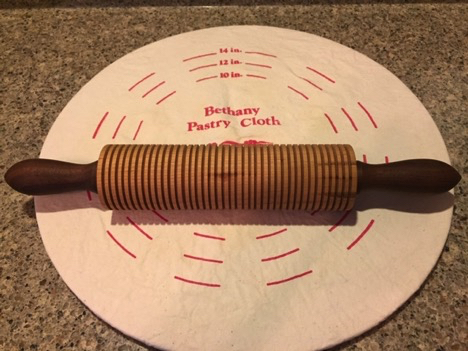 Kyle’s heirloom lefse rolling pin made by Jeff Luedloff of the Minnesota Woodturners Association. Handles are walnut and the rolling pin cherry. Mix dry ingredients except for flour. Add flour and stir with spoon until dough is crumbly. Make into balls the size of golf balls. Roll thin and grill at 450 degrees F.
I cooled the dough for a half hour or so and then sped up cooling by putting the dough in the freezer and then back to the fridge. Anyway, give 7 Up lefse a try, for fun and just to say you’ve had it. You, like me, may find that it’s … not bad at all! A stack of 7 Up lefse.